Up there is the view from my window seat on the plane from Atlanta to Philadelphia. 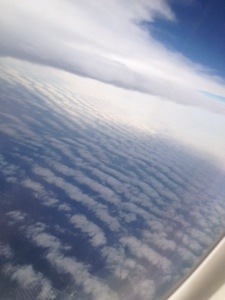 I’ve always loved the view from above the clouds; it’s like looking through clear ocean water to the reef below. While I wait on my connecting flight to London, where I will meet up with my friend MC Lars and my band mate in Malibu Shark Attack, Rocky O’Reilly (for the first time EVER! What!? ), I thought it’d be a good idea to post some info about the tour upon which we are embarking. Malibu Shark Attack is reuniting for the first time ever to join MC Lars on his Zombie Dinosaur headlining tour of the United Kingdom in the cities of Leicester, Glasgow, London, Brighton and Bristol. After that, we Sharks will be hopping back to Rocky’s hometown, Belfast, on the 23rd to officially celebrate the release of our debut album. Then we’re doing it again in Derry the next day. I am both lethally excited and joyously terrified of this adventure. But it’s too late to stop it now. I’m at my gate and I hear London Calling. This entry was posted in Uncategorized and tagged england, international, ireland, live shows, malibu shark attack, mc lars, tour, uk. Bookmark the permalink.